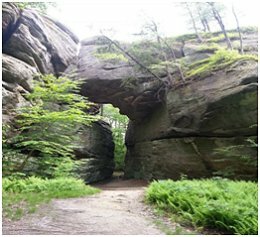 Enjoy great vistas of the Allegheny Plateau from Rock City Park on 505 Route 16 South in Olean, New York. Once a “fortress” for Indians, the city of rocks is an adventure you’ll want the whole family to enjoy. Gigantic rocks with descending crevice staircases lead to trails strewn with great monolithic rocks of dramatic sizes and shapes. This prehistoric ocean floor is the world’s largest exposure of quartz conglomerate and is one of the great natural wonders of the United States. Allow one hour minimum for your stay. Wear casual clothes and comfortable shoes. 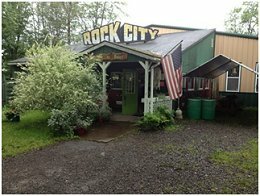 After your hike visit the Souvenir and Rock Shop for rocks, gems and refreshments. A picnic area invites you to linger and relax. Group tours are welcome with prescheduling.